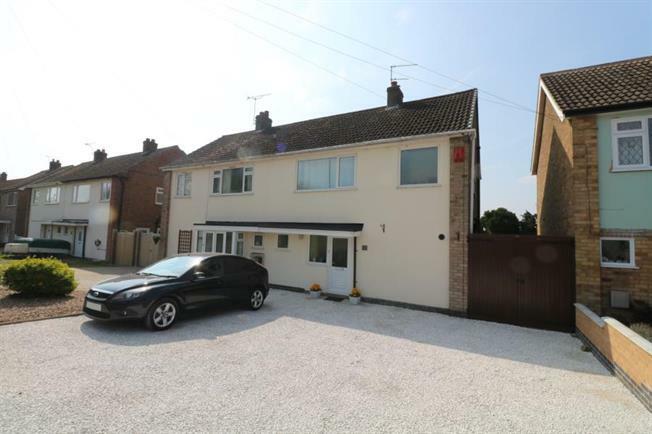 3 Bedroom Semi Detached House For Sale in Leicester for Offers Over £210,000. Situated in the village of Huncote to the South West of Leicester City Centre is this beautifully presented three bedroom semi-detached family home. The accommodation is spacious and versatile and occupies a generous plot that enjoys views of the open countryside to the rear. The accommodation itself comprises of an entrance hall off of which is a large cloakroom cupboard. There is a 'L' shaped lounge/diner which has a gorgeous feature open fireplace set into the chimney breast and sliding patio doors that open up to the rear garden and floods the room with plenty of natural light. Off the lounge/diner is a refitted kitchen complete with a contemporary and high quality range of base and wall mounted fitted units with granite effect roll-edge work surfaces. There is space for all essential appliances including plumbing for a washing machine. To the first floor there are two well proportioned double bedrooms and a further good size single. The third bedroom offers the flexibility to be used as a home office, dressing area or play room. Also on the first floor is a bathroom which has a three piece white suite to include a shower cubicle with electric shower, low flush WC and wash hand basin set onto a useful storage unit. At the front of the property is a driveway that provides off-road parking for at least three vehicles and double timber gates provide access to the side and rear. At the rear is a well maintained and landscaped garden with a paved patio seating area, a section laid to lawn and a shingle rockery that is interspersed with various plants and shrubs. The plot itself would also allow scope for extension both the side and to the rear subject to local planning permission. Internal viewing is highly recommended to truly appreciate what this superb family home has to offer.